The creative process for large fashion corporations, from design houses to fast-fashion behemoths, is breakneck, furious and often wasteful. Fashion companies on average deliver up to eight collections a year and mass companies can churn out up to 52 “micro-seasons” a year, with new trends hitting stores weekly. Season after season, week after week, ideas are generated, textiles are developed, prints and patterns are drawn, stitches, patterns and techniques are developed and samples are created. All parts of the product development life cycle are carefully detailed and documented to share with manufacturing facilities around the world. This process utilizes thousands of people and continues non-stop, every day, all year long. In order to keep deliveries on time, and ultimately, customers coming back for more, this process requires working twelve months or more in advance. And once the process of garment creation is underway there is an immediate need to market these collections. Industry giants dedicate tens of millions of dollars a year to launch massive advertising and public relation campaigns in order to keep fashion feeling new and exciting. Like the creation of apparel, marketing also follows a relentless life cycle creating new visuals and ideas of engagement season after season. Ideas are generated, photo shoots are executed, media is bought, pictures are printed, websites designed, stores are updated, packaging created, direct mailers are delivered and the excitement continues. How many of these ideas are actually new? How many times are garments recreated? Is fashion ever original? How many unique and innovative images and campaigns can be created year after year? Or is repetition reinvention? Are familiar designs and a recognizable aesthetic the keys to a successful brand identity and, ultimately, longevity? 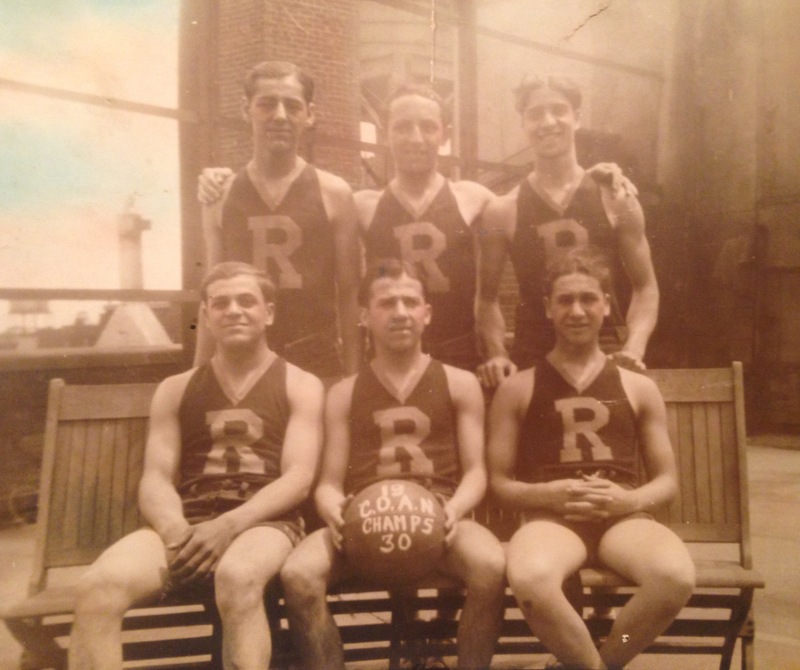 Does recognizing a brand’s past help build a solid future? Or does it matter at all? My thesis is rapidly approaching and the process of research has begun. These are the questions my I will attempt to answer by exploring the value and meaning of corporate archives in today’s fashion industry. It will also take a look at principles and practices—how to build them, what the benefits are and the cultural effects they may or may not. Creating archives for non-fashion related corporations has been well documented, dissected and debated. There are countless journals and associations related to the research and development of business archives. Many of these journals, paper and articles are going to help serve as research for my thesis. Yet despite the growing interest in creating fashion-related archives, evidenced by the number of diverse brands that have existing archives, there remains a dearth of information on the development, utilization, management of these private libraries. In addition, business and historical archiving, as well as library science are void of fashion specific information technology. Creating Digital History has served as a wellspring of information, rich in resources and platforms that will benefit my thesis and possibly the end use of creating a real archive for my current employer. 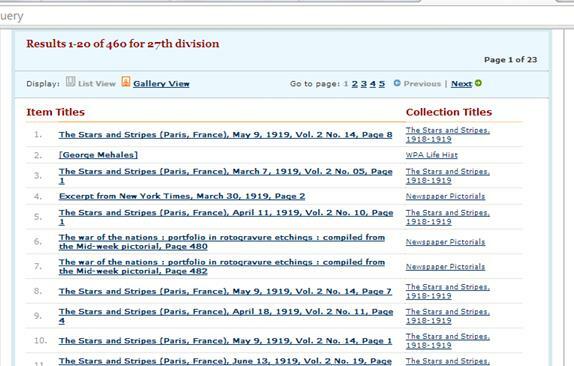 The use of Omeka as an archival tool, while not the most fluid or advanced interface, is basic and solid in its straightforward and uncomplicated user experience. I can clearly see how this could translate into a similar system for a fashion company and the development of a corporate repository. All of the information combined in this course has given me hope and confidence that a universal, yet customizable, archiving system for fashion companies can easily be developed. Now bring on my thesis! Whitehead, Shannon. “5 Truths the Fast Fashion Industry Doesn’t Want You To Know.” Huffington Post. October 19, 2014. The day I visited the Nuyorican Poets Cafe the front door was being replaced. The door was old and for security purposes had to go. Still, staff were adamant that they wouldn’t be getting rid of the old one, after all “there’s a lot of history in that door”. For an institution as notorious and embedded as the Nuyorican, even seemingly irrelevant parts of architecture have stories to tell. However, if there’s a lot of history in the front door that is nothing compared to what can be found inside. 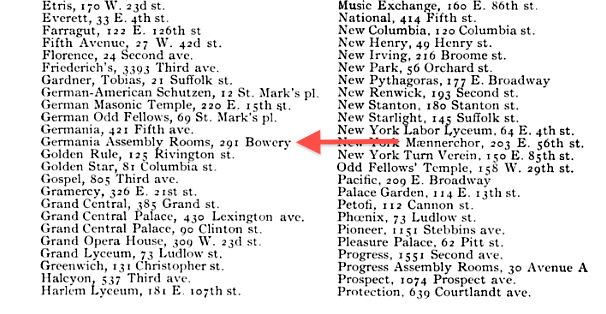 The Nuyorican has not always been at its current location on East 3rd Street. 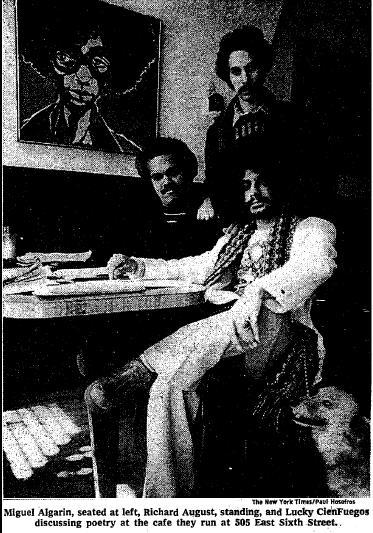 It was initially set up in 1974 on East 6th Street in the apartment of Miguel Algarín, one of the cafe’s founding members. Popularity soon forced it to expand into an Irish Pub on the same street and in 1981 to where it currently stands. The cafe closed a year later but re-opened in 1988 and since then the top three floors of the building have been given over to its archival collections. It was these collections that were the purpose of my visit but I arrived with no concept of their size. Executive Director Daniel Gallant had told me that there was a lot to see; he was not wrong. What the collections might lack in organization they more than make up for in content. 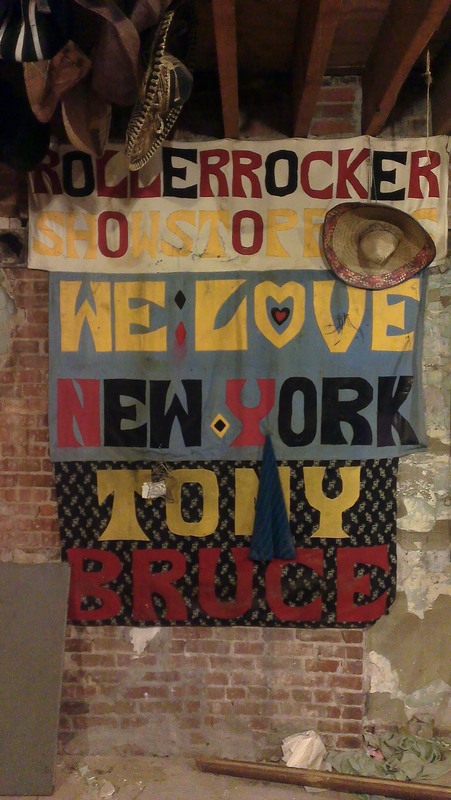 The walls are decorated with banners from previous performances and coat rails are jammed with costumes. There are countless boxes of recorded material as well as signed photographs and DIY posters from the 1980s. The material spans the entire history of the Nuyorican, from the early days of Miguel Piñero, Pedro Pietri, through Amiri Baraka and Rome Neal, and into the current crop of new artists making their name at the cafe. 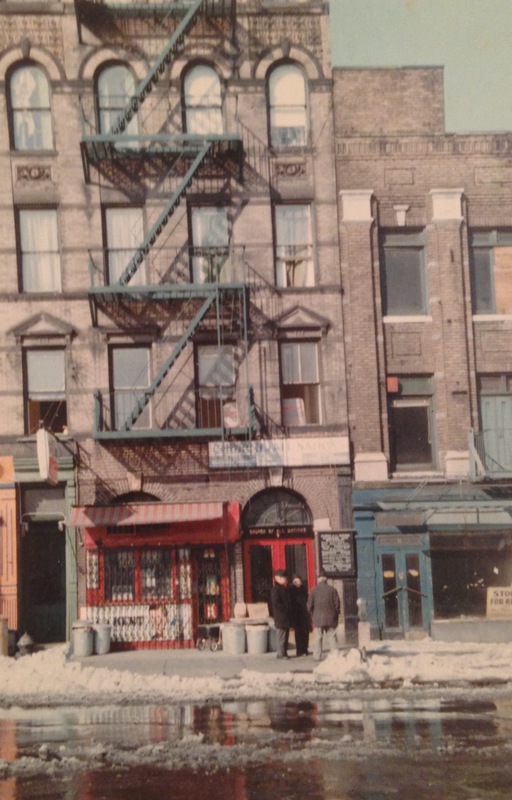 In essence the Nuyorican holds an almost complete cultural and material history of the late 20th Century East Village. and there is always a concern that this could happen again. The Nuyorican is not opposed to the material being archived elsewhere but this is often easier said than done. First this would require one of the many archival sites in New York to come forward to accept the material. However, Daniel Gallant explained to me that in order for the vast collection to be properly understood it would need the input of someone familiar with the history and current work of the cafe and this is constrained by both time and money. I would be surprised if numerous other non-profit institutions in New York do not also encounter the same problem. I have often found it interesting that we make such clear distinctions between hoarding and collecting, often only allowing the former to become the latter when practiced by someone of notoriety. Yet if there is a distinction to be made it is surely in terms of organization. Any individual or institution may keep hold of material from their past but it is when that is transformed into something accessible and understandable that it becomes a recognizable collection. The case of the Nuyorican shows how difficult this can be. The East 3rd Street building will soon be renovated and the top floors will becomes artistic and theatrical studios. When this happens the material will have to move; it would be a tragedy if it did not find the home it deserves. 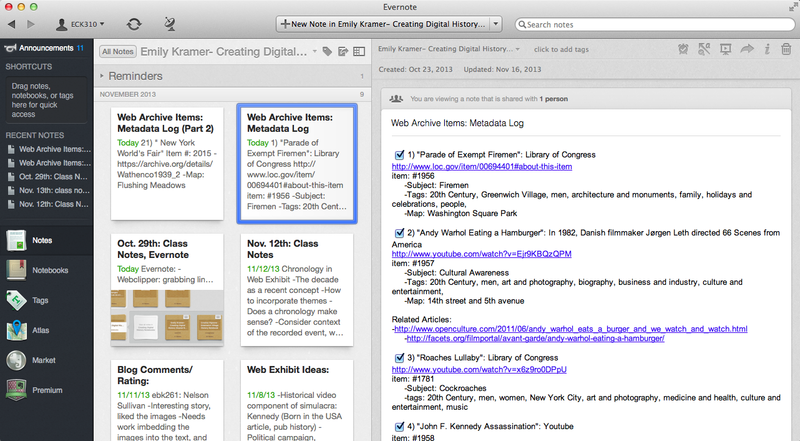 I had never used Evernote software before this semester. To be honest, I hadn’t even heard of it. I utilized a hybrid-system of typed and handwritten notes that were saved in various places in an array of formats. I would usually transcribe class notes onto my laptop, highlight my digital format readings in Mac’s Preview, write out reading notes from printed materials into notebooks, list things I needed to remember on sticky-notes, and work out assignment outlines in a more compact and accessible ‘travel notebook.’ I wouldn’t say Evernote resolved my obsession with diversified note taking, but I would say it helped organize some of the confusion. 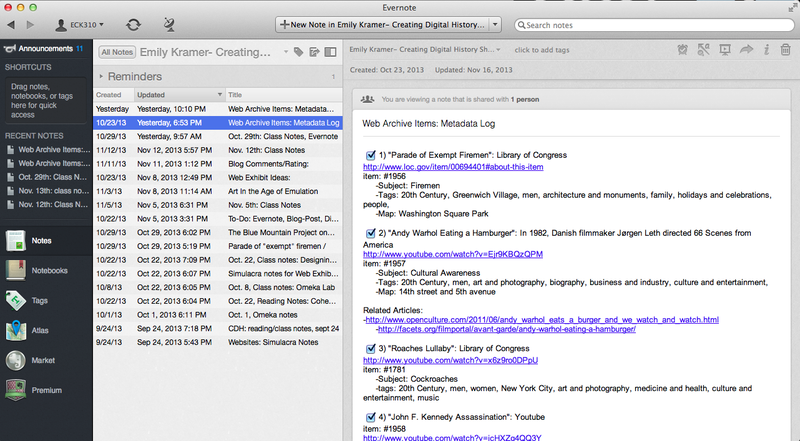 This is the basic interface of Evernote, although there are a few different outlines you can choose from. I used the list feature here to keep track of which projects I have edited. This feature is great for to-do lists. There are multiple note taking programs out there, from Google Keep to OneNote, and sometimes it’s just a matter of which is most compatible to your personal note-taking style (or aesthetic preference). However, there are a few features of Evernote that make it a little more versatile than its competitors. To begin, Evernote isn’t an exclusive Microsoft/P.C. 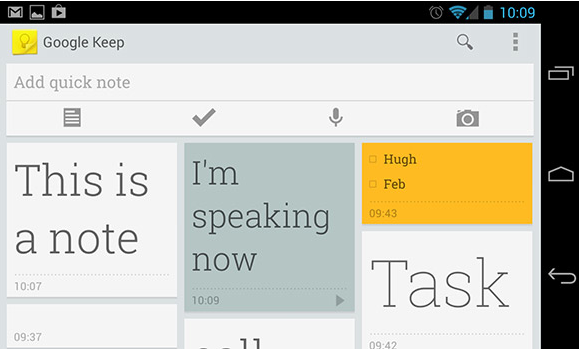 product like OneNote, or an Android preferred system like Google Keep. This means that if you do make the daunting crossover from PC to Mac, Android to iPhone, or vice versa, your Evernotes will still be compatible. The software’s diversity is threefold in its ability to be referenced on computers as a program, mobile devices as an app, and online as a website. This means you can sync it to your different devices or access it online if you are without them. This does lead into to some interface problems, however. When using your iPad or Kindle the keyboard cuts off most of the Evernote screen making it difficult to use it for anything but reading notes already taken. If you write all your notes on a computer and then use your iPad for referencing, this won’t be a problem. But that’s likely not the case, and this is something to consider. While I haven’t used OneNote or Google Keep extensively, I have used Google Docs, which seems to be another popular online note storage method. The appeal of Google Docs is its alignment to a word processing program. You can type up entire papers, save them with multiple users for coediting, or simply have them in the Web 2.0 ether for ready accessibility. This is a dream for the increasing number of students without printers. It also allows you the flexibility to make folder under folder ad infinitum, a more cumbersome task with Evernote. But there is a reason I have been using Evernote for the majority of my notes and outlines, and Google Docs only for my paper drafts. The fluid interface and various tools Evernote offers allows me to take more diverse notes, and track different media elements that would be tricky with Google Docs. The Web Clipper, for instance, ‘clips’ sites you come across that pertain to your interest and store them in your folders for easy access. Because your notes can appear in square thumbnails, previewing what is in them, it’s easier to reference what you were saving. I find this helpful when I am in the beginning stages of writing a paper; having accumulated all my research, it’s an efficient way to skim my resources while I put my draft together. The Web Clipper also gives you the option of saving the site as an article, a simplified article, full page, bookmark, or screenshot. Then there are ‘Markup’ options so you can make notes on the page to remind you why you clipped it. You can also tag the page, a tool that runs throughout Evernote, which provides subject clouds to pick out themes or find notes from. 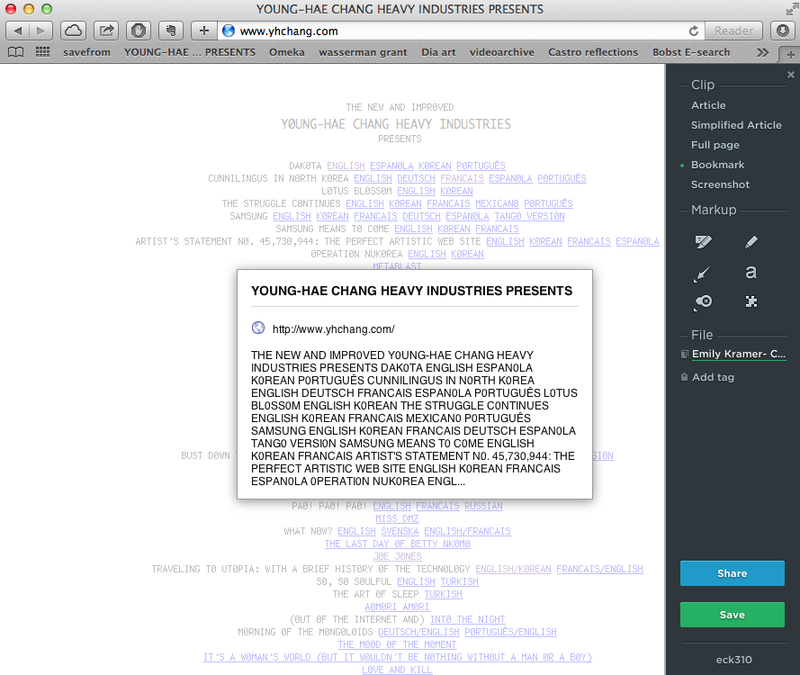 The tagging feature is helpful in quickly amassing related topics, especially for a final paper or research paper where relevant notes could be spread out at various points and in various notebooks. I find this particularly helpful when I have notes from different classes that could strengthen my paper, but that I might not have remembered if they were limited to the notebook they are stored under. 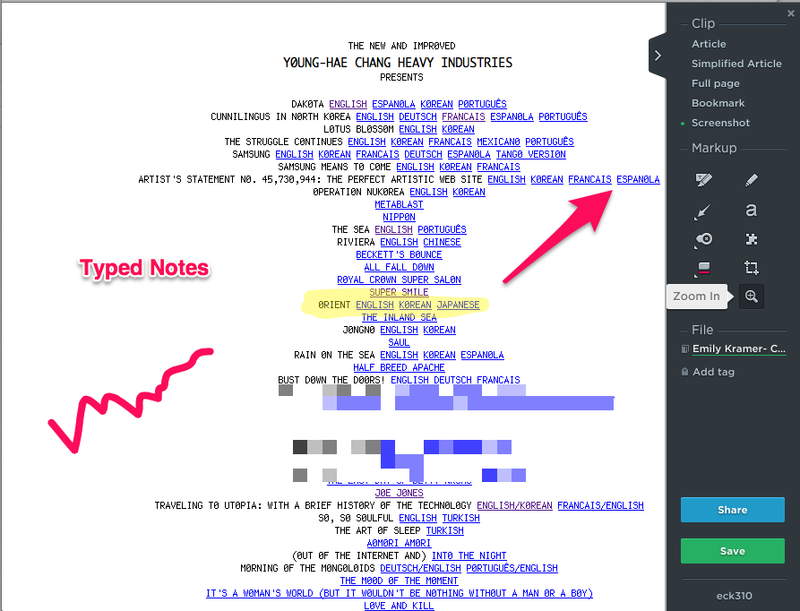 If the tags are too broad for you to find the specific parts of the note that relate to your interest, there is a text mining capability in the search bar. If you are writing on ‘modernism,’ but can’t remember which parts of the note are specifically on the topic, you can mine it for the keyword. 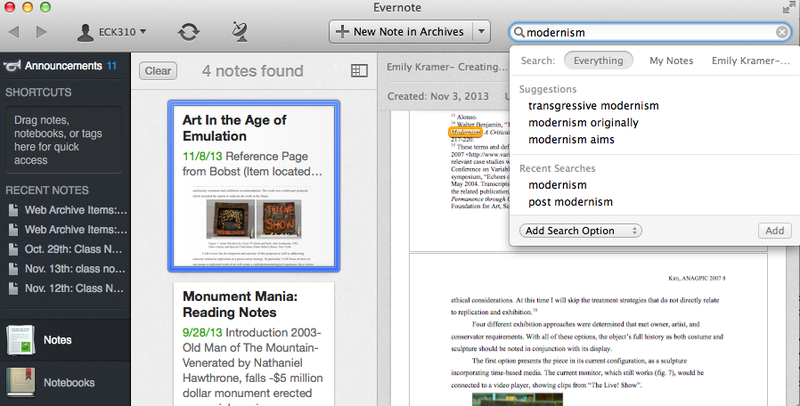 Evernote also allows you to upload photos and videos that could be important to your topic or interests. Storing them among your other notes, instead of a different media file, has a similar benefit as the Web Clipper. They are in sight and easily referenced, making them more likely to be intergraded into your project or paper. However, if thumbnails are aesthetically too chaotic for you there are multiple ways to organize and display your notes. You can reduce the files to just dates and headlines, no images or displays, and place these either at the top of the program or to the side. In conclusion, I use Evernote for all note taking: in class, reading notes, attaching preview-highlighted readings, web clipped articles, etc. When it comes to writing papers the format isn’t compatible, I would much rather use Google Docs. If Evernote integrated a space for writing papers in a word processing format, I would be inclined to make the switch over. However, the large number of my peers and professors who use Gmail and Google Docs, and don’t use Evernote, might be an impasse. For now, I will mix the two programs. Evernote is great for researching, outlining, and brainstorming for a paper and Google Docs is better for drafting and editing the paper. I rarely find a need for a paper notebook, and with all the capabilities of Web 2.0, this will become increasingly true. 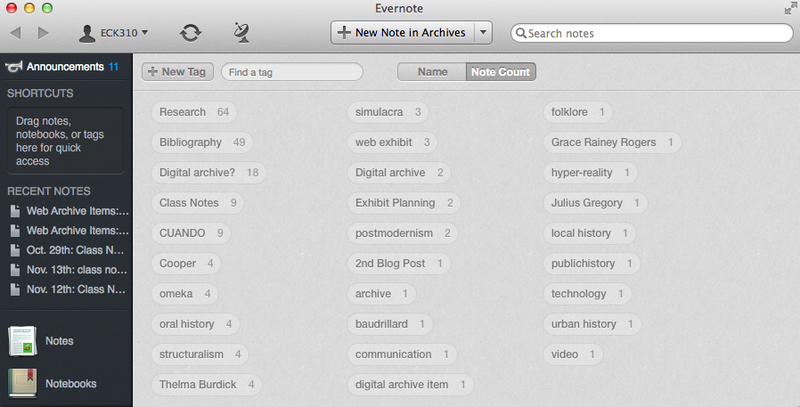 I think there are improvements to be made for Evernote, and look forward to their upgrades. 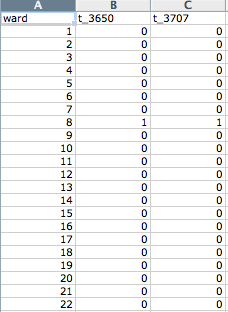 As my last post demonstrated, historical population statistics can offer a rich source for historical analysis. 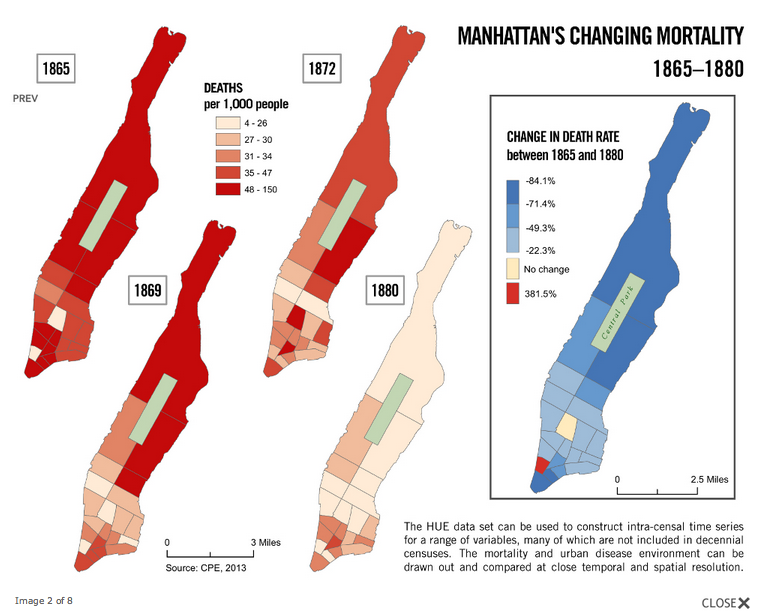 The outbreaks of yellow fever south of Fulton Street forced drastic migration patterns and arguably aided in the development of Greenwich Village from a pastoral paradise to an urban hub. 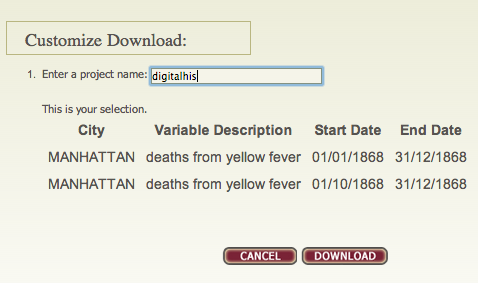 If the information were available, I think it would be fascinating to track and aggregate data on contractions of yellow fever, deaths, and migration patterns from the late eighteenth and early nineteenth century. Fortunately, geographical information systems (GIS) help us to collect, analyze, and then interpret this sort of data. It has been described as the merging of cartography, statistical analysis, and computer science, and GIS allows users to search and analyze spatial information, edit data, and present the results of all these operations on maps. Unfortunately, HUE data set does not span back to the times of the early yellow fever outbreaks that I wrote about previously (circa 1790-1830). It does, however, have statistics on deaths from yellow fever starting in the 1860s. 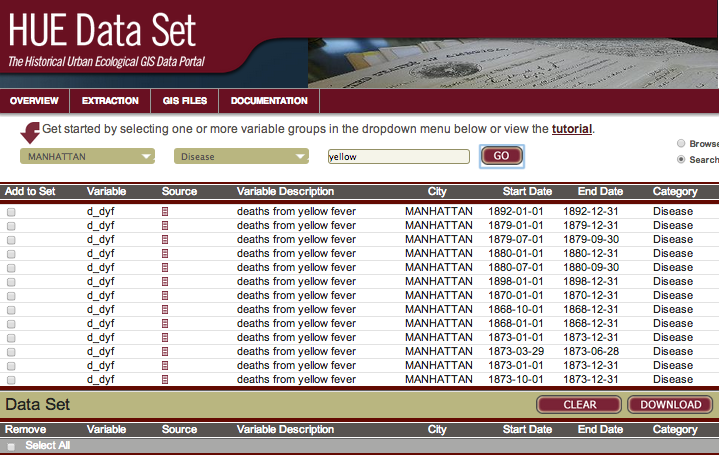 For a researcher (like me) interested in Greenwich Village history, he or she could choose “Manhattan” as their city, and select a number of different data categories; for example, “crime” or “disease,” along with another search value. I chose “yellow fever” These search criteria only bring up 13 results. When I downloaded the results, the folder contained a text file with the sources used to collect this information and an excel sheet with the number of deaths per ward in 1868. Astoundingly, it appears that only one death from yellow fever is reported from that year. Considering the havoc that yellow fever caused only forty years ago, I can use this information to conclude that the main culprits of the disease (the poor water supply) had been mostly rectified by this time. Behold, the power of geographical information! Historical application of GIS is a fairly new, but extremely powerful tool for analysis. I’m excited (albeit — as a GIS novice — a bit confused at times) at the research possibilities of this new tool. The Center for Population Economics has a PDF tutorial for the HUE data set, and I highly encourage researchers at all levels to see what they can uncover. Thanks to the copyright laws relating to public domain, it’s fairly easy to find newspaper articles relating to World War I on the internet. 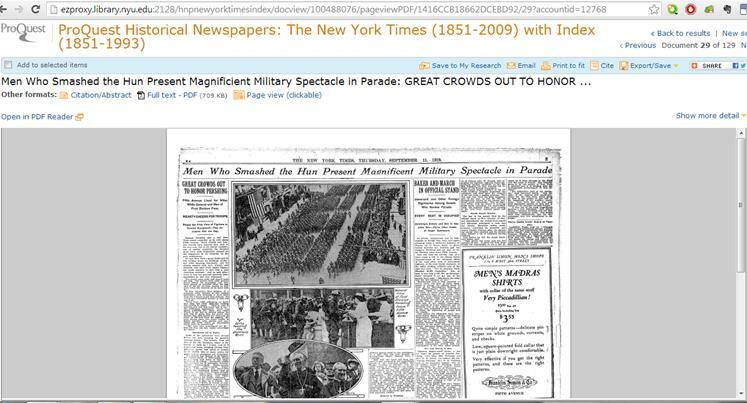 While researching the impact of World War I on Greenwich Village, for example, I found many resources in the New York Times digital archive. However, while almost all of the paper’s articles since 1851 are available online, there are very few pictures available to accompany the text. In many cases, older editions of the New York Times didn’t feature many pictures, but in some cases, they were just not included when the article was clipped and scanned. Line after line of printed words does not make for a very exciting digital archive or web exhibit, though, so I set out to find the missing newspaper photographs. The first resource I’d like to share is one that was recommended by a classmate of mine: the ProQuest Historical Newspapers Database. This database contains scanned copies of 25 newspapers, dating back as far as the 1700s. The New York Times archives from 1851 to 2009 can be found here, just as they can on the New York Times website. 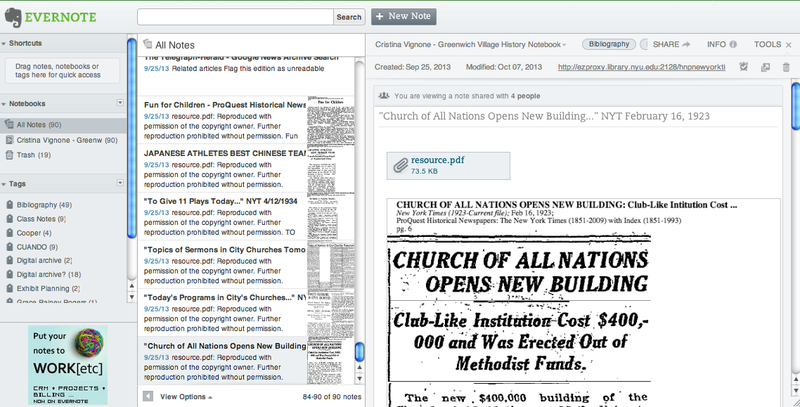 Much like the New York Times archive, ProQuest allows you to view whatever pictures were clipped along with the article. However, ProQuest also gives you the option to view the article in “Page View.” This allows you to see the article in context, with all of the articles and pictures that would have surrounded it. In the regular article view there is no way to know whether an article has pictures or not without doing a lot of “guess and check.” Sometimes one article on a topic will have no pictures, while a related article right next to it on the page will have accompanying photographs. Article view, which the New York Times uses exclusively, forces you to look through every article on a given topic to find photographs. 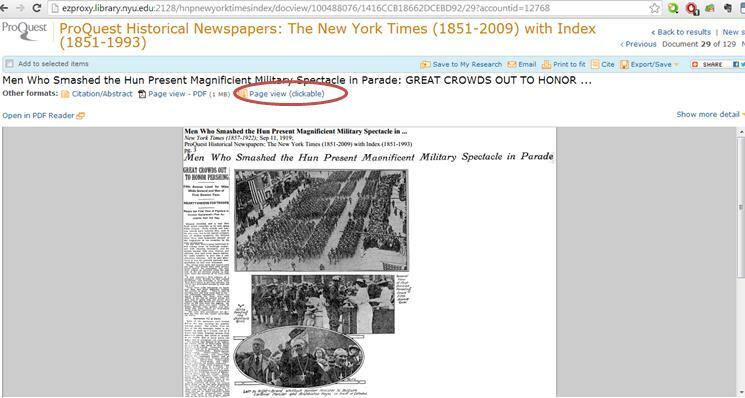 ProQuest’s page view, though, allows you to flip through the pages of a newspaper to find related articles and photos you might have missed with a simple keyword search. 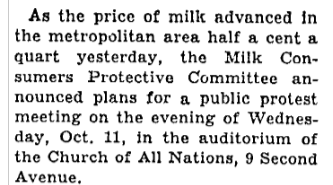 There is one major disadvantage to ProQuest Historical Newspapers, though. 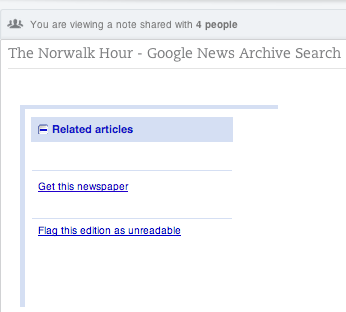 The database is available by subscription only, which means that grad students like me can enjoy the opportunity to flip through hundreds of years of digitized newspapers, but an independent researcher would have to pay to access this collection. Also, while the pictures are easier to find than they are on the New York Times website, I still felt that there had to be a better way to find good newspaper photographs from the early 1900s. 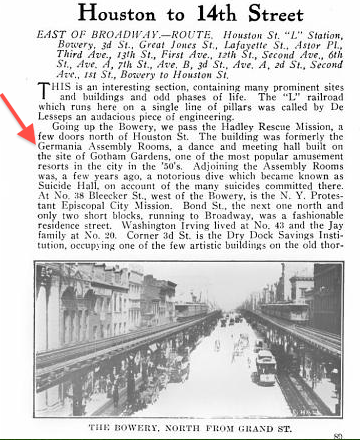 One of the best resources that I found for these photographs is the newspaper pictorials collection in the Library of Congress’ American Memory Project. American Memory is a digital archive of items from the Library of Congress that aims to document the “nation’s memory.” It includes over 5 million photographs, documents, sound recordings and videos from colonial times through the 20th century. Some of these items are only available online through the Library of Congress and not through their creators. 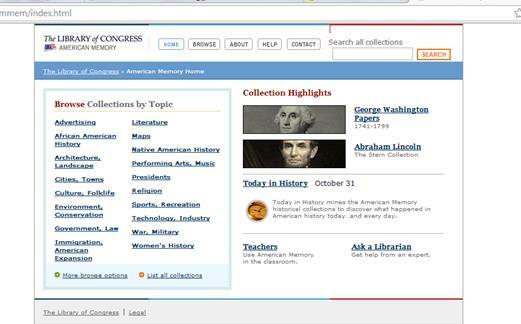 The American Memory site can be browsed by topic, collection or time period, or by doing a general keyword search. In my case, it was the keyword search that turned up the best results. 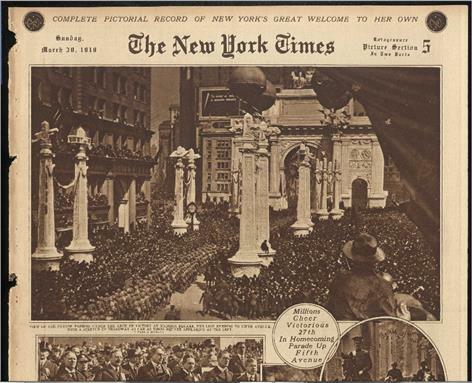 I searched for “27th Division,” a unit in the US Army in WWI that was welcomed home with a large parade up Fifth Avenue. The results were extensive, and very helpful. Among the long list of articles from the Army’s “Stars and Stripes” newspaper for troops, I found a New York Times result from an entire collection of newspaper pictorials. Feeling intrigued, I clicked the link to the question and a found a wealth of photographic knowledge at my fingertips! Pictorial sections became popular features of American newspapers during WWI. A new process of photoengraving, known as rotogravure, meant that newspapers could produce high quality images on cheap quality paper. With Americans taking part in their first European war, rotogravure pictorials became a useful way to show the American people on the homefront the harsh realities of the war abroad. Each Sunday, the New York Times and the New York Tribune would feature a full section of rotogravure images. The New York Times also published a pictorial section in the middle of the week, and later compiled images from these sections into a book entitled The War of the Nations: Portfolio in Rotogravure Etchings. This volume included images from the mid-week pictorials published from the start of World War One in 1914 until the signing of the armistice in 1919. The Newspaper Pictorials collection in the American Memory Project includes images from this book, as well as those from the Sunday pictorials in the New York Times and the New York Tribune. The Tribune features a number of hand-drawn images, but the Times has pages of photographs from the war and the homecoming of the troops. While the newspapers themselves are available online or on microfilm, the difficulty of properly scanning the rotogravure sections has made them difficult to obtain until now. Thanks to American Memory, though, the images can be clearly viewed online or downloaded as a PDF. Finally, I had found my missing photographs.